Bing officially launched in Japan today! 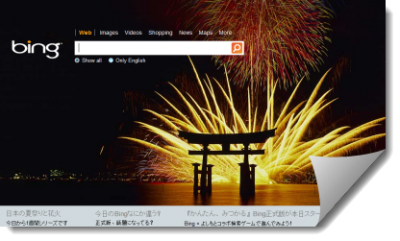 Bing has launched the localized Japanese version of Bing homepage. Along with the Japanese Bing, it appears that the localised Australian version too has been launched. These markets now have their own localised hotspot too! Have a look at the Bing Japan & Bing Australia homepage. You can follow Bing Japan on Twitter here!